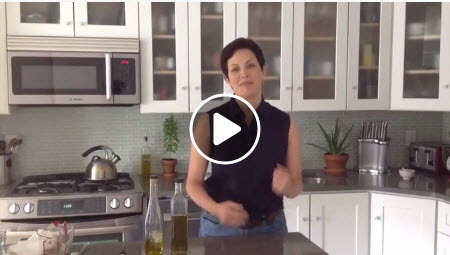 We are thrilled with Ellie Krieger's Facebook Live presentation of an olive oil pie crust. Ellie's pie crust can be used for savory pies such as tomato pie or quiche or can be sweetened to be used for desserts such as pumpkin pie. We were especially impressed that this pie crust can be made with no special equipment. The pie crust can be frozen for later use. Here is the recipe if you want to make this pie crust at home. This recipe can be found in Ellie's award winning book You Have it Made: Delicious, Healthy Do-Ahead Meals (Houghton Mifflin Harcourt 2016). In a medium bowl, whisk the whole-grain pastry flour, all-purpose flour and salt. In a small bowl or spouted pitcher, whisk the milk into 1/3 cup of the olive oil until it is well integrated. Make a well in the flour mixture, pour in the oil mixture then combine with a fork until crumbly. Brush a 9-inch pie plate and one side of a 10-inch square piece of foil with the remaining teaspoon of oil. Pat the mixture into the prepared pie plate as you would a graham cracker crust. Prick the pie crust in a few spots with a fork. Line the crust with foil (oiled side touching the crust) and top with pie weights or raw rice and bake for 10 minutes. Remove the weights or rice and the foil and bake for another 5 minutes, until golden. Allow to cool completely. Watch Ellie present her recipe and give tips on buying, using and storing olive oil below. She is a New York Times bestselling, James Beard Foundation and IACP award winning author of five cookbooks. Her most recent is You Have it Made: Delicious, Healthy Do-Ahead Meals (Jan 2016). Ellie is a weekly columnist for The Washington Post and she has been a columnist for Fine Cooking, Food Network magazine and USA Today. Ellie speaks regularly at events around the country, appears on national television shows, such as Today, Good Morning America, and The Wendy Williams Show, and has been featured in magazines like Better Homes and Gardens, People, and Self, to name a few.